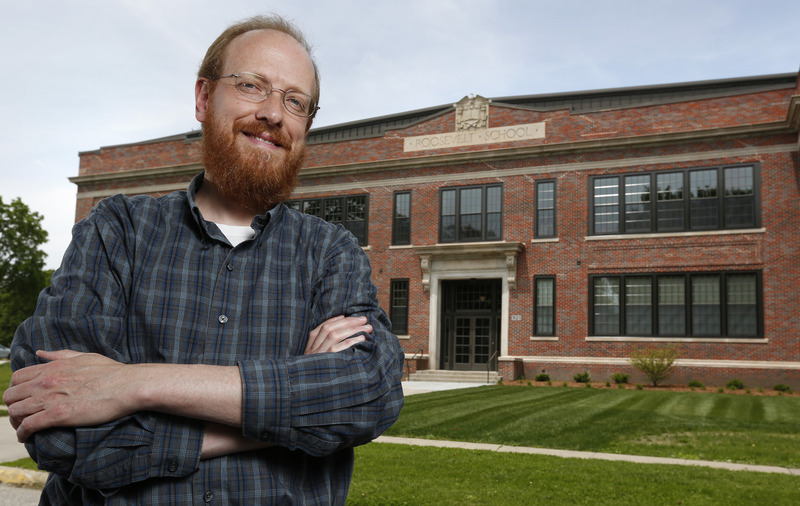 Ted Grevstad-Nordbrock, a new community and regional planning assistant professor at ISU, is developing a proposed program in historic preservation, the state's first. Download larger photo by Christopher Gannon. AMES, Iowa -- When the state historic preservation annual conference convenes in Winterset June 25, there will be a new kid on the block. And Ted Grevstad-Nordbrock, who opened up shop at Iowa State University in January, is eager to hang out his shingle statewide. Although Grevstad-Nordbrock may be new to Iowa, he's been an historic preservation professional for years. Now, as an assistant professor of community and regional planning, he is tasked with developing a new, multidisciplinary program in historic preservation within ISU's College of Design. His position was created under the ISU president's high impact hires initiative. The proposed Iowa State program will be the first historic preservation program in Iowa, pending Board of Regents approval. And, according to the National Council for Preservation Education, it will be one of only a handful of programs in the Midwest. Undergraduate and graduate certificates will likely be offered first, and a graduate degree is an option for the future. "This was an exceptional opportunity," Grevstad-Nordbrock said. "I've rarely seen anything like it before, where you're charged with starting an academic program in precisely the area in which you've been working for so long." In order for the program to be successful, Grevstad-Nordbrock says he and his students need to "get out there and knock on buildings and explore." "It's critical for historic preservation students to work with private developers and government agencies and property owners on projects and to get their hands a bit dirty. It’s fun, to be sure, but it’s also how they learn," Grevstad-Nordbrock said. "One of the great pleasures of this discipline is that it has both classroom and applied components," he said. "In preservation, there's no shortage of opportunities for students and faculty to work in communities. I hope we'll be doing a lot of outreach around the state." During his brief tenure in Iowa, Grevstad-Nordbrock has found the state to be "a wonderfully, surprisingly rich place" for historic buildings. "It's really varied. I'm amazed at the works by Louis Sullivan and the buildings by other well-known regional architects, as well as the ethnic architecture, archeological sites and the fun vernacular places—the quirky roadside buildings and structures like the Lincoln Highway bridge in Tama, for example," he said. In fact, says Grevstad-Nordbrock, Iowa's small towns and cities can benefit economically by preserving and promoting these historic resources, thereby staking a claim on what is special about their community. "In a world where places increasingly compete for residents and capital reinvestment, it really becomes important to be able to understand, promote and highlight the things that make your individual place — be it a town, region or state — unique," he said. For example, heritage tourism — when a community uses its historic resources to generate tourism and revenue — can be big business for small towns. Grevstad-Nordbrock quotes a study from Michigan showing that tourists whose travel revolves around historic places tend to spend more money than the average tourist. And communities can work together to promote a shared historic resource such as the Lincoln Highway or other heritage byways. Grevstad-Nordbrock has been impressed with completed preservation projects he has visited in Iowa towns like Sioux City and State Center. "In State Center, the local Main Street rep took me on a tour of the National Register of Historic Places listed downtown and showed me photos of what some of their restored buildings looked like before they used historic rehabilitation tax credits to stabilize and bring the buildings back to their original state," he said. "When you see them in person, it's remarkable. They look gorgeous, really beautiful. And much of the work was done by dedicated local volunteers. It was sweat equity at its best," Grevstad-Nordbrock said. "Many of these turn-of-the-century buildings would be vacant shells today — not home to productive businesses — if not for the work of the community to preserve them." "What I like about preservation, too, is that it is relevant to so many different areas of study. For example, issues involving the elderly and youth both touch upon preservation. Preservation has implications for gerontology and how people can age in place. Pre-World War II buildings tend to be in more walkable communities and are often better suited for aging populations," he said. "At the same time, there is a trend nationwide at the other end of the age spectrum, in terms of what constitutes a desirable community in which to live," he said. "There's a shift now from suburbs to urban neighborhoods, to places where there's a diversity of people and housing choices and plentiful entertainment options. These neighborhoods tend to be the most historic, oldest places in a metropolitan area." In larger cities like Des Moines, preservation can and has been instrumental in community revitalization by bringing neighborhoods back to life. Developers piggyback the federal historic rehabilitation tax credit with other tax incentives to create attractive funding packages that promote the rehab of income-producing, historic properties. Furthermore, incentives like the low-income housing tax credit are used alongside preservation incentives to fund residential rehab projects that include both market-rate and subsidized units. While Grevstad-Nordbrock and his steering committee develop the new program at Iowa State, he will teach College of Design students courses on historic preservation planning, sustainability, theory, methodology and economics. He will also develop programs for ISU Design West, the College of Design's satellite program in Sioux City. And he and his students will be reaching out to work with Iowa's small towns and urban neighborhoods on their preservation projects. "When I talk with developers, local preservation committees or community leaders, the State Historic Preservation Office — everyone sees a need for this program in Iowa," he said. "And this will be a first. There is no other like this in the state." Grevstad-Nordbrock will develop the new program with a steering committee of five design college faculty with diverse backgrounds, as well as students in design and other Iowa State colleges. Tim Reinders, Main Street design specialist at the Iowa Economic Development Authority, represents the state’s interests on the committee. This summer, Grevstad-Nordbrock is writing a white paper describing the vision for the new program. For the past 12 years, Grevstad-Nordbrock has served as historic preservation specialist for the Michigan State Historic Preservation Office (SHPO) in Lansing. He also has worked at the SHPO in Wisconsin. He has a doctoral degree in geography from Michigan State University, and master of arts degrees in historic preservation planning and art history from Cornell University and the University of Wisconsin, respectively. Ted Grevstad-Nordbrock, who opened up shop at Iowa State University in January, is eager to hang out his shingle statewide. Although new to Iowa, Grevstad-Nordbrock has been an historic preservation professional for years in Michigan and Wisconsin. Now, as an assistant professor of community and regional planning, he is tasked with developing a new, multidisciplinary program in historic preservation within ISU's College of Design. His position was created under the ISU president's high-impact hires initiative. "One of the great pleasures of this discipline is that it has both classroom and applied components. In preservation, there's no shortage of opportunities for students and faculty to work in communities. I hope we'll be doing a lot of outreach around the state." "In a world where places increasingly compete for residents and capital reinvestment, it really becomes important to be able to understand, promote and highlight the things that make your individual place — be it a town, region or state — unique." Grevstad-Nordbrock and his students recently visited ISU's Design West facility in Sioux City (above). And they stopped by the Woodbury County Courthouse in Sioux City, a National Historic Landmark and "arguably the world's best example of a Prairie School governmental building," Grevstad-Nordbrock says (below).